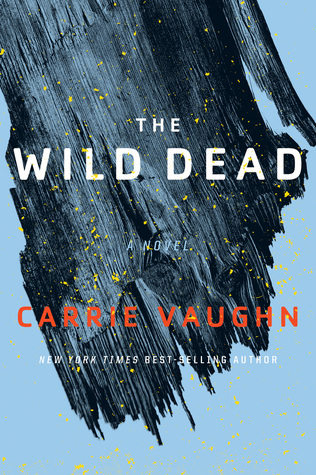 The Wild Dead is a sequel to last year’s Bannerless, which I loved. (Check out my review of Bannerless, here.) In Bannerless, author Carrie Vaughn does an amazing job of creating a post-apocalyptic world in which the focus is not on the disaster itself (known here as the Fall), but on life 100 years later. Humanity has survived, and in the Coast Road community (California), life revolves around households — groups of adults who build a home together, a communal dwelling where all are invested in the success of the whole. Communities are groups of households with a central committee and a commitment to the greater good. It’s a mostly agrarian society, where everyone contributes according to their abilities, and all are provided for… provided, that is, that some basic rules are followed. The guiding principle in this world is producing enough, but not more. Quotas govern all farming, so that no one destroys the scarce natural resources by using up too much, too quickly. Households that demonstrate that they can support themselves may be granted banners, the most coveted reward of all. A Banner is a license to have a baby. A household may earn a banner through hard work and dedication — but a household that tries to skirt the rules may be denied a banner forever. Enid of Haven is an investigator — the closest thing this society has to law enforcement. In this post-technology world, Enid can’t rely on firearms or fingerprint dusting or forensic science; she has to use her brain and her people skills to ask questions, dig deep, and find the truth of a community’s secrets. Enid is good at her job, but as The Wild Dead opens, she’s mostly annoyed about being called away from her home in Haven to carry out a seemingly pointless investigation right as her household is expecting its first baby. The investigation is set in the community of Estuary, a marshy, unpleasant location where the people live in uneasy proximity to one another. There’s no true closeness or cooperation in Estuary — the people seem argumentative and suspicious. And while Enid’s case is simply about determining whether an old house should be preserved, the situation becomes complicated by the discovery of a body belonging to an outsider. As the investigation shifts from mediation to a murder case, Enig and her partner Teeg try to find a way to get the people of Estuary to share their secrets. The Bannerless world is opened up further in this second book in the series. In the first book, the author did an amazing feat of world-building, showing us the Coast Road society, the nature of this post-tech world and how the people live. At the same time, she gives us a glimpse into the history of the Fall and how civilization re-formed in the century since then. In The Wild Dead, we explore further, and learn for the first time about the people who live outside the society of the Coast Road, choosing to live wild and with fewer resources rather than be restricted by the rules that dictate so many basic elements of life, including child-bearing. The puzzle of the dead body is intriguing, and I enjoyed seeing Enid use her wits and intuition to read the situation in Estuary and finally arrive at the truth. The mystery aspects of the story are quite good, and held my attention from beginning to end. But truly, what I really love about these books is the detailed description of this unique world and how it works, and getting to understand the psychology of a society which has survived what could have been the end and has created a new version of the future. Enid is a terrific main character — smart, strong, fair, and devoted to her people and to doing what’s right. She’s not perfect, and she struggles with herself quite a bit, but in the end, she’s committed to the essence of being an investigator: helping others, and being kind. I highly recommend both Bannerless and The Wild Dead. I’m really hoping this will be an ongoing series. I can’t see myself ever getting tired of Enid or her world. I don’t see people talking about these books much, but they are on my TBR. Glad you enjoyed book two, the world sounds fascinating! It really is! I love that the post-disaster world here actually makes a lot of sense, and doesn’t seem like a horrible way to live.